The Challenger adds a SRT Demon model for 2018. The Demon is a drag race specialist producing over 800-bhp and over 700 lb-ft of torque. 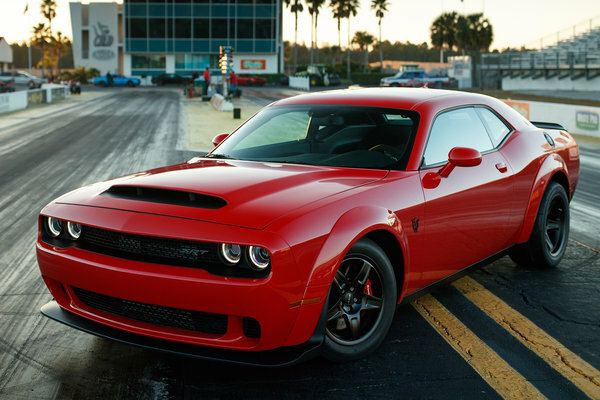 Dodge rocked the high-performance car world in 2014 with the 707-horsepower Charger SRT Hellcat and Challenger SRT Hellcat, building supercar performance at affordable prices. They were the most powerful muscle cars ever - until now. � Today, Dodge is shaking the foundation of the entire performance car industry, launching New York International Auto Show week with its wickedly fast new 2018 Dodge Challenger SRT Demon - highly capable on the street, absolutely dominating at the drag...Read.